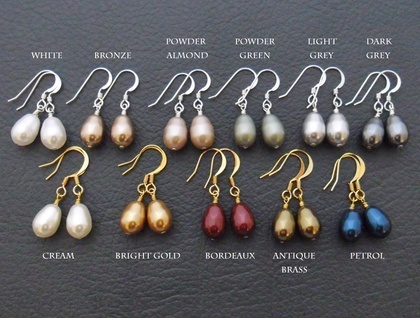 Dainty, teardrop-shaped, Swarovski faux pearls are wrapped on fine, silver-plated pins, then hung from sterling silver hooks. Swarovski pearls are made by the makers of the famous Swarovski crystal, and have a crystal core that simulates the weight and feel of a real pearl. They are fade- and perfume-resistant, with a luxuriously smooth, flawless finish; and are generally regarded as the best imitation pearls available. 'Bronze': a soft, metallic beige or fawn with a pinkish tinge. It looks like a deeper, metallic version of the 'powder almond' colour. 'Powder Almond': a soft, dusty, almost pinkish beige hue. 'Powder Green': a soft, dusty sage green. 'Light Grey': a silvery, shiny grey. 'Dark Grey': deep, stormy grey. 'Bright Gold': a warm, opulent golden hue. 'Bordeaux': a deep, rich wine-red. 'Antique Brass': an unusual colour that might be described as metallic brown with a hint of green in it. 'Petrol': an unusual, deep, rich blue with a teal tint to it; what might be called a peacock or kingfisher blue. It's a gorgeous shade unique to Swarovski. The photographs show some earrings with gold plated hooks: these are also available, in a separate listing, in my Felt shop. 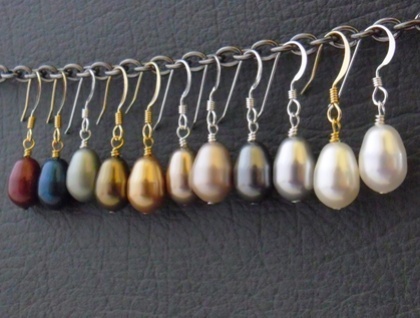 This listing is for one pair of earrings with silver hooks only, but you can choose from any of the pearl colours shown. To make your colour selection, simply leave a note in the 'notes for Silverlight' field that will appear when you check out of Felt. If you would like multiple pairs of these earrings, send me a message via the 'contact this maker' link on the left, and I will check to see that I have the quantity you want in stock before replying promptly to you. 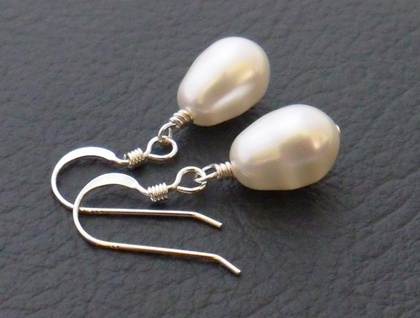 The 'Simple Pearl' earrings with sterling silver ear-hooks measure 31mm from top to bottom. 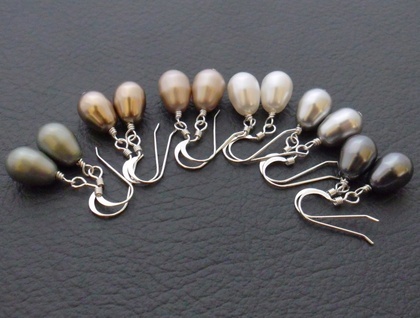 The little pearls are 11mm tall, not including the wire-wrapping at their tops. The ear hooks are stamped '925', which means that they are at least 92.5 percent pure silver (the definition of sterling silver). Please note that while I try my level best to depict the colours accurately in my photographs, different computer monitors display exact hues differently. I have a refund policy if you are not satisfied with your earrings (see my profile here on Felt for details).